I have something shocking to tell you. Today, August 25, 2017, I have absolutely no earthquake precautions in place whatsoever. No, I have not simply cracked under the pressure; it’s because I have recently moved to a new home, and since the whole concept of moving one's possessions is the opposite of the concept of preventing one's possessions from moving, seismic bracing and other quake precautions need to be undone. We spend all of our time discussing earthquake precautions in the context of implementing them (that is, bracing, fastening, arranging, etc. ), and spend very little time talking about tearing it all apart! So for a change of pace, I am keeping a mini-diary of my thoughts as I start undoing my earthquake precautions while preparing for the move. You will read about it when completed after the move [10/21/17: haha, that’s an understatement…], but I am keeping track in real time. The move will be August 4th; movers are packing me up on August 3rd, and I plan to have everything ready to go by the end of August 2. 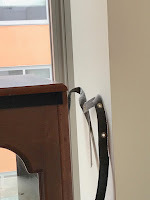 Various dates in July: As home inspections and buyers’ mortgage lender inspections have taken place, I have made sure to inform the inspectors and appraisers that the top row of cabinets are using push latches so they should not attempt to pull those doors open. I have also mentioned that many objects are stuck down. July 22: I had friends over for dinner and I unstuck some of my good quality wine glasses that were protectively adhered in my cabinet using quake putty. When I washed the glasses and put them back, I just placed them on the shelf without re-sticking them down. Then I pulled the others up as well; now none of my wine glasses are stuck down and they are ready to be packed by the movers. July 25: Starting to remove some small objects stuck to surfaces of minor furniture that I plan to discard. Quake putty is coming off of things without much trouble, although there is usually a bit that doesn’t come off right away that I pull off by dabbing at it with the putty that I have already removed. I am pulling off the clear objects stuck to clear glass shelves, including the Waterford crystal glasses that were featured in my article about quake gel and how objects will slowly slide over a period of months if the surface is not perfectly level, leaving a snail trail. I’m happy to report that these objects were still securely stuck, with no snail trails, which means I ultimately leveled the shelves well! I’ve pulled up one of the plant pots that had been stuck to the top of a cabinet with putty. So now, we are entering a period in which more and more objects are NOT braced, and one hopes an earthquake does not choose this next week to hit. I won’t be unfastening things until I have to, so most furniture and objects are still braced/stuck, but the items I’ve freed up today for discarding/donating/giving tomorrow are sitting freely, including one tall display case and one glass/iron small tall end table that were strapped to the wall. July 28: Been staring for a few days at the tall display case, which it turns out I will give away next week, so it is sitting there totally unbraced with its straps hanging out unfettered. Such tempting of fate; I am a WILD man! I think I will not have the movers move my 12 gallons of bottled water because there is already a bunch of water at the place to which I’m moving. I just opened one of these bottles, with a use-by date of 2011. Remember the FDA said you can ignore that date and keep these unopened commercially bottled jugs indefinitely, but I figured this was a good opportunity to see what it tastes like. I opened it, poured a little into a glass and prepared myself for an off taste that should mostly go away after I have had a chance to shake up the water and aerate it, but actually, the water tasted fine! I have updated my article about the water use-by dates to include this 6-year experimental result. July 29: I’ve started taking pictures off of the walls; mostly those that have been on the walls for 8 years and are on picture wires hanging from maze picture hooks, with small dabs of quake putty under their lower corners to make keep them straight, and to push the bottom out a bit so that the relatively thick maze hook (a little plastic brick) doesn’t cause the top to be too tilted forward. When removing quake putty, little bits can remain behind, but these can be picked up by dabbing at them with the remaining quake putty. 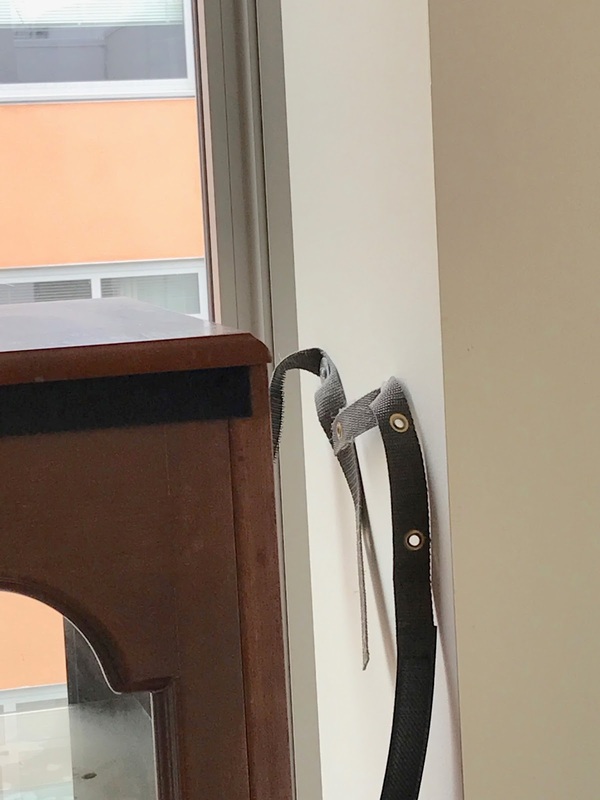 This typically works well but I can see that when the putty has been in place for years, it’s a bit harder to get the remaining bits off of the wall. I succeeded and found that if I dabbed with the rest of the putty and then pulled away rapidly and to the side, it was more efficient at removing the remaining bits. Still, there is indeed a slightly shinier area on the flat paint where the putty was. I have already written previously that cutting small pieces of a modern self-sticking polymer pad like “Gripeez” (I have no financial interest in this product) and placing them under the bottom corners instead of putty works well; it does not leave the shiny spot on the flat paint that putty leaves. July 31: I’ve been giving away furniture that isn’t getting moved, sold, or donated, and patching holes as I go. I’m also dumping out the rest of that >6-year old water, again not because it’s not good anymore, but because I just don’t want the movers moving a bunch of water. It’s worth noting that I’ve had 12 of those commercial gallon jugs of water, on shelves so not pressing down on each other, and individually bagged in large Ziploc bags; and none of them appear to have leaked. There’s no condensation inside any of the outer bags. I did manage to drop one of them, and the jug ruptured and water poured out…into the outer bag, which held. My klutziness enabled me to confirm that having that outer bag is a really good idea, especially if these things might get clobbered in a Murphy’s Law earthquake. I just took one of my bedroom stereo speakers off of the dresser, repeating the angst-filled experience I’ve had in several previous moves because I stuck it down with quake putty, and over the years, the putty has spread and flattened to make a freakishly strong attachment; but I ultimately manage to pry it off each time without leaving a mark. Wow, I forgot I tried an experiment with the other speaker 2 years ago when I put it on a wicker hamper and figure that quake putty would not be removed well since it would work its way in between the wicker “twigs” so instead I stuck it down with four “Gripeez” (see above). It worked excellently. The speaker did not come off too easily (so the attachment was good) but I was able to kind of peel the speaker off of the wicker surface without too much trouble, and the Gripeez came off of the speaker nicely with a bit of pulling and stretching. I’m removing the pictures that I had stuck to the walls last year with Command Picture Hanging Strips, and I’m very impressed. The pictures were just as firmly adhered as when I put them up, but easily separated at the Velcro-like interlocking layers when I used a peeling motion; then I removed the Command Strips by pulling the tabs to make them lose adherence, and the two pictures came off leaving no holes and no marks whatsoever. There is no sign that anything had ever been stuck to those walls. Very nice. August 3-10! I then fell into the inevitable swirl of constant activity that didn’t allow me to write as I went along, but I will mention the important points. First, I made sure to unlatch, unstick, and unbrace everything rather than having the movers do it. Not including taking pictures off of walls, that was a total of 85 objects detached, both large and small. I was filling a lot of holes in the wall, and of course, the last couple of days in the old place were spent with no seismic precautions; good thing a large quake did not occur during that time! And in the new place, it’s taking a long time to set up and unpack; bracing is not practical yet. So that guy who keeps nagging everyone to take precautions (that would be me) is currently in a place where bookcases can fall over, objects can fly through the air, cabinet doors can open, etc. But as I’ve said in other articles about not running out of buildings and so on, this is an odds game. If you can reduce the chances of an earthquake causing problems by 99%, that’s pretty good even though the 1% chance is still there. Likewise, if I am in a seismically secure home all the time except for a few days once a decade, then my chances of being slammed by a quake have been enormously reduced! Epilogue October 21!! I’ve been so swamped that I have not had a chance to polish this article until now. A perfectly poorly timed 2-week illness and several unforeseen events didn’t help. It’s taken a while to put the new place together and much of the bracing and sticking can’t really be done until things have found their final resting places, so my home has been a model of not practicing what I preach… although by now, all large furniture is well braced, some but not all objects are stuck down, and notably I have not had a chance to install cabinet latches yet but will be doing that soon. And of course, within days of moving in, we had a tiny earthquake on the San Andreas fault just a few miles offshore of where I just moved that most people didn’t feel but I did, and the Mexico quakes were in the news a lot; let’s just say that being me, I’m getting more worried about being massively embarrassed by an earthquake than being injured by one!